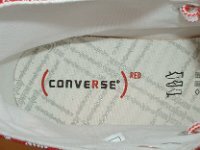 Photo gallery of a couple of special Product Red issues by Converse. 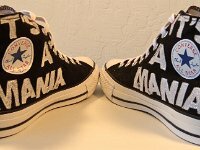 1 Product Red High Top Chucks Inside patch view of a right "It's Not a Shoe, It's a Mania" product red high top. 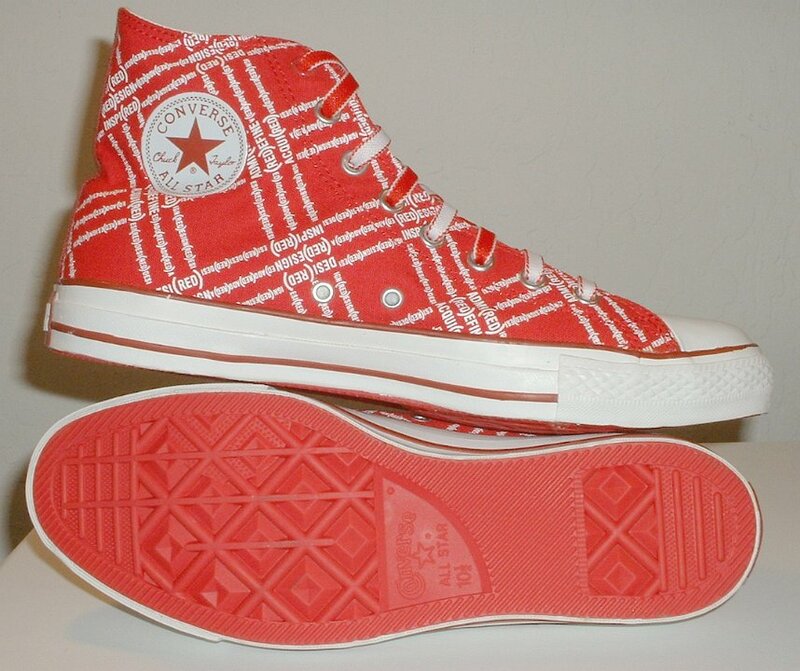 2 Product Red High Top Chucks Outside view of a right "It's Not a Shoe, It's a Mania" product red high top. 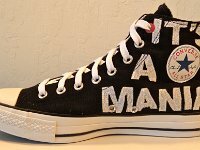 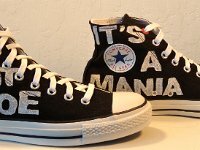 3 Product Red High Top Chucks Inside patch view of a left "It's Not a Shoe, It's a Mania" product red high top. 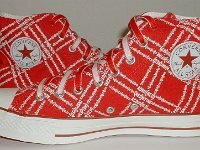 4 Product Red High Top Chucks Outside view of a left "It's Not a Shoe, It's a Mania" product red high top. 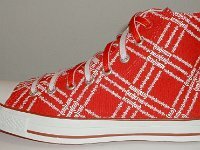 5 Product Red High Top Chucks Rear view of "It's Not a Shoe, It's a Mania" product red high tops. 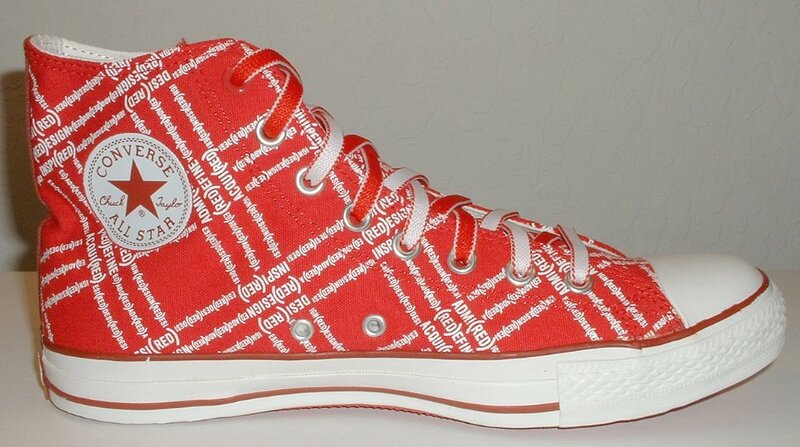 6 Product Red High Top Chucks Angled rear view of "It's Not a Shoe, It's a Mania" product red high tops. 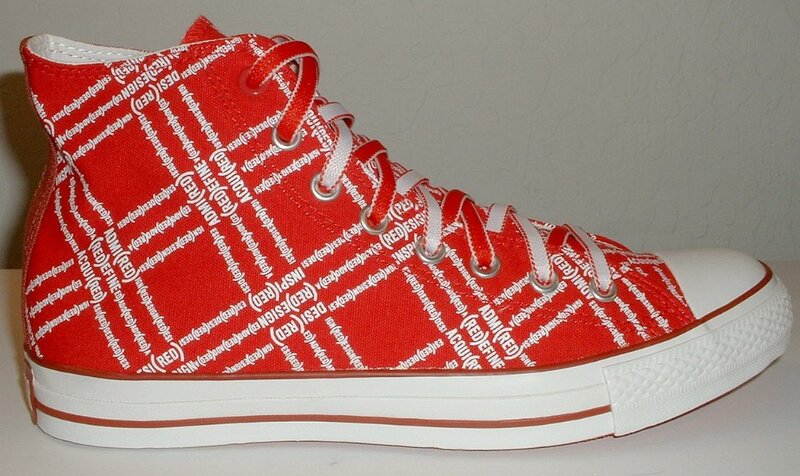 7 Product Red High Top Chucks Angled side view of "It's Not a Shoe, It's a Mania" product red high tops. 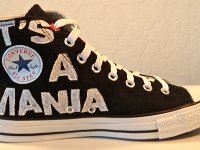 8 Product Red High Top Chucks Front view of "It's Not a Shoe, It's a Mania" product red high tops. 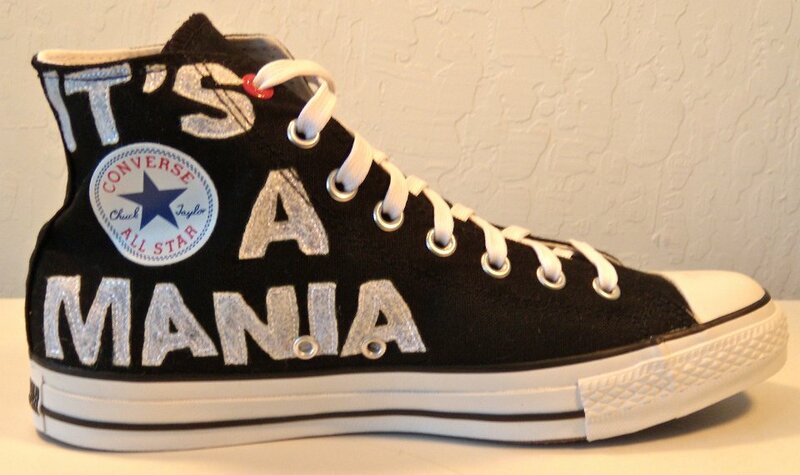 9 Product Red High Top Chucks Angled front view of "It's Not a Shoe, It's a Mania" product red high tops. 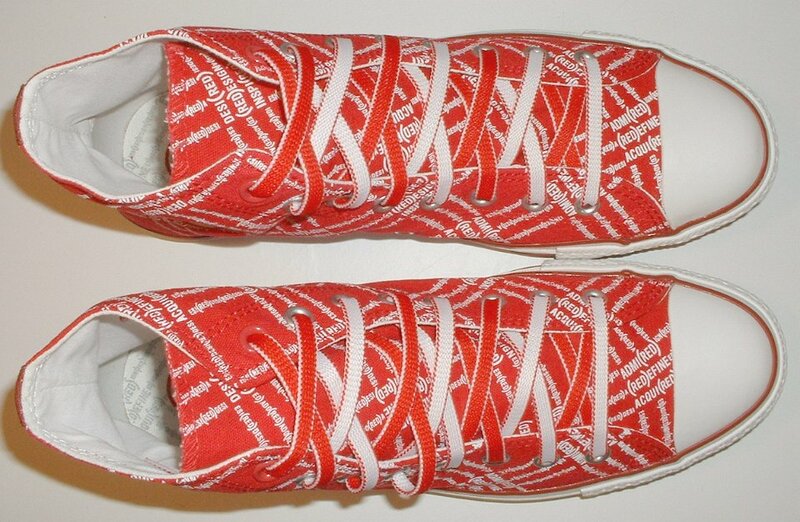 10 Product Red High Top Chucks Top view of "It's Not a Shoe, It's a Mania" product red high tops. 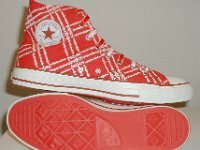 11 Product Red High Top Chucks Inside patch views of "It's Not a Shoe, It's a Mania" product red high tops. 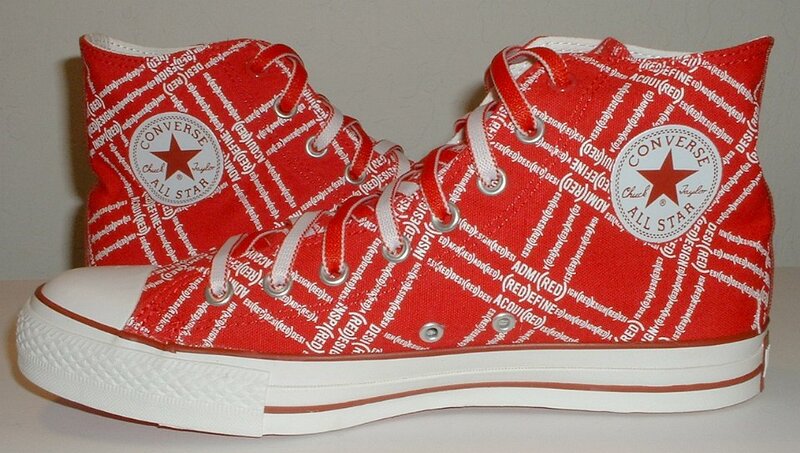 12 Product Red High Top Chucks Outside views of "It's Not a Shoe, It's a Mania" product red high tops. 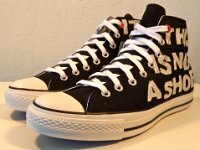 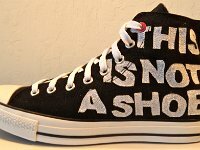 13 Product Red High Top Chucks Shot showing the complete slogan. 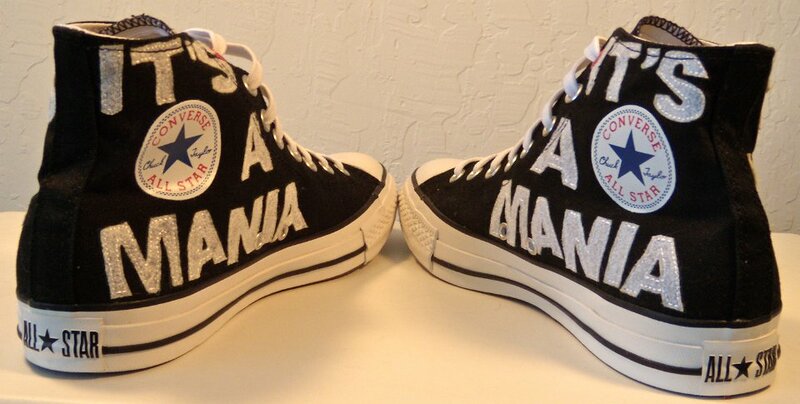 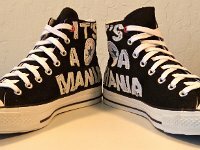 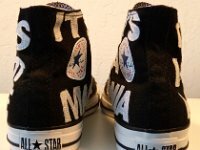 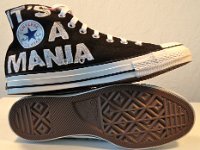 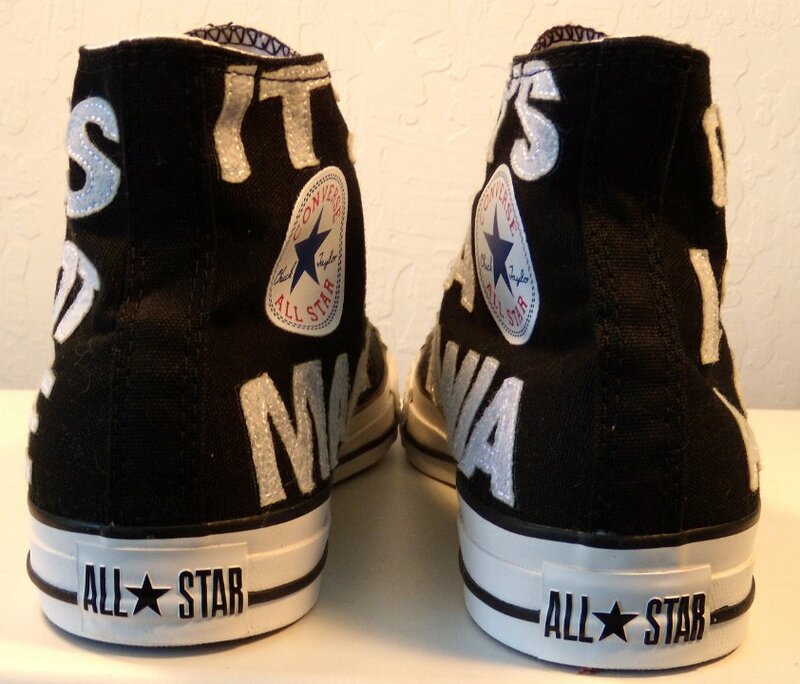 14 Product Red High Top Chucks Inside patch and sole views of "It's Not a Shoe, It's a Mania" product red high tops. 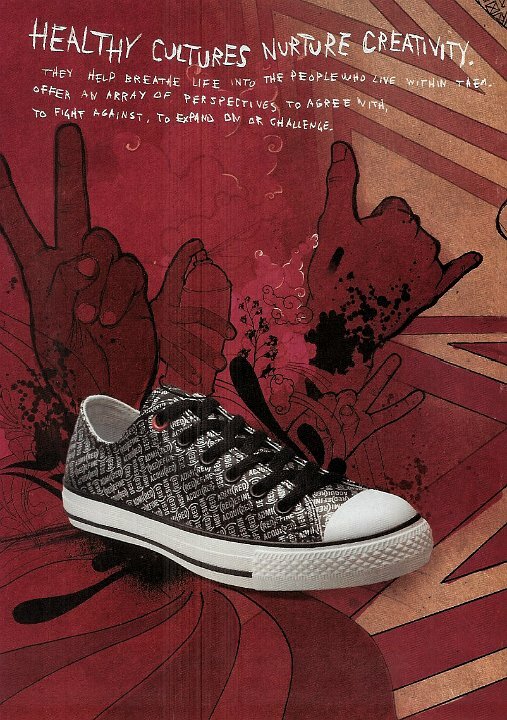 15 Product Red High Top Chucks Ad for The Ramones product red high tops. 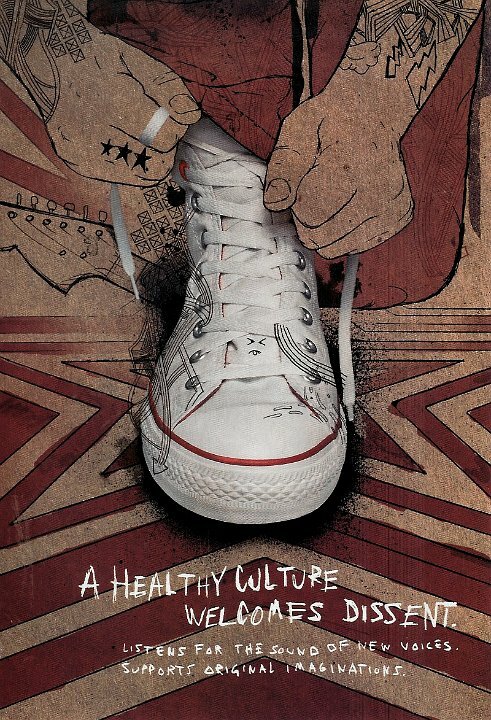 16 Product Red High Top Chucks Ad for a white print product red high top. 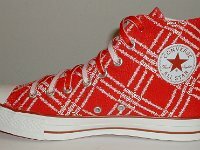 17 Product Red High Top Chucks Advertisement for a product red low cut. 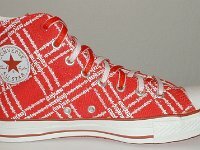 18 Product Red High Top Chucks Special canvas bag with drawstring to store the shoes. 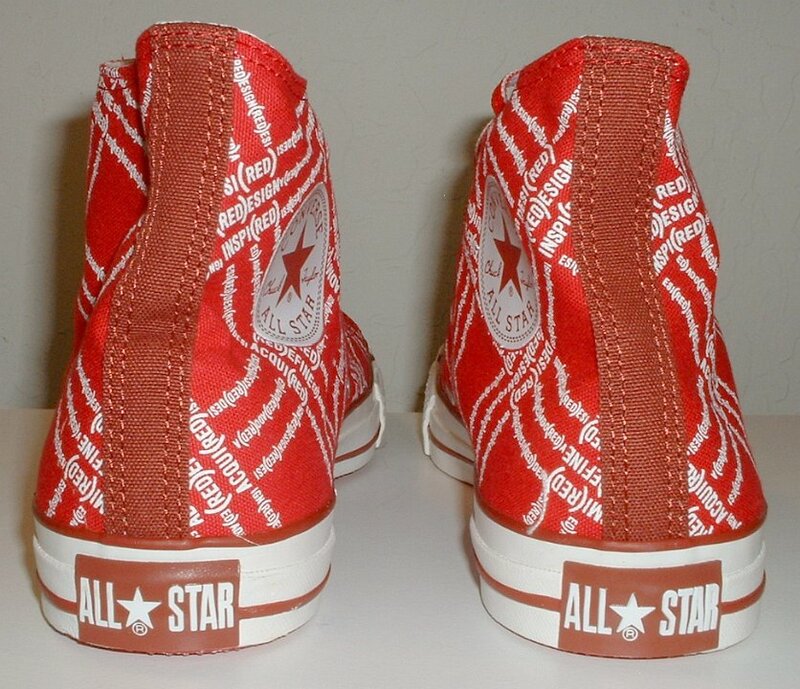 19 Product Red High Top Chucks Inside patch view of a left Product Red high top with red and white reversible shoelaces. 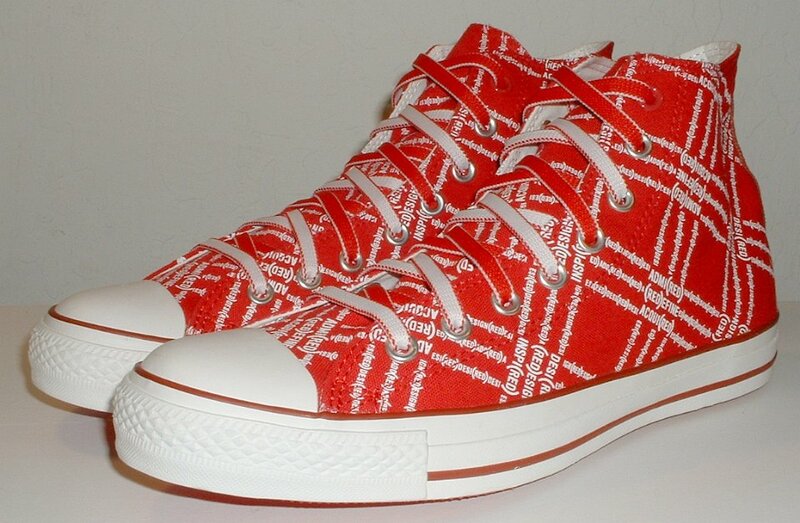 20 Product Red High Top Chucks Outside view of a left Product Red high top with red and white reversible shoelaces. 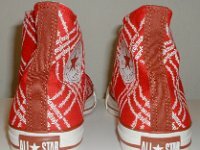 21 Product Red High Top Chucks Inside patch view of a right Product Red high top with red and white reversible shoelaces. 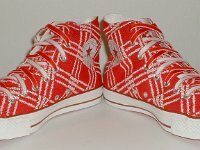 22 Product Red High Top Chucks Outside view of a right Product Red high top with red and white reversible shoelaces. 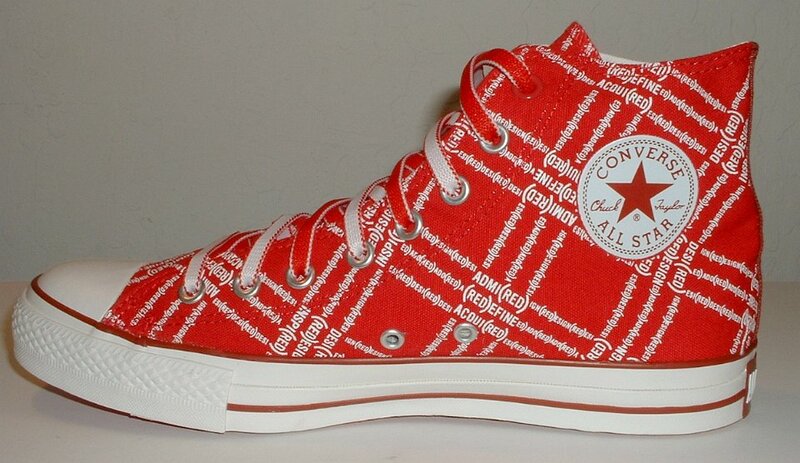 23 Product Red High Top Chucks Rear view of Product Red high tops. 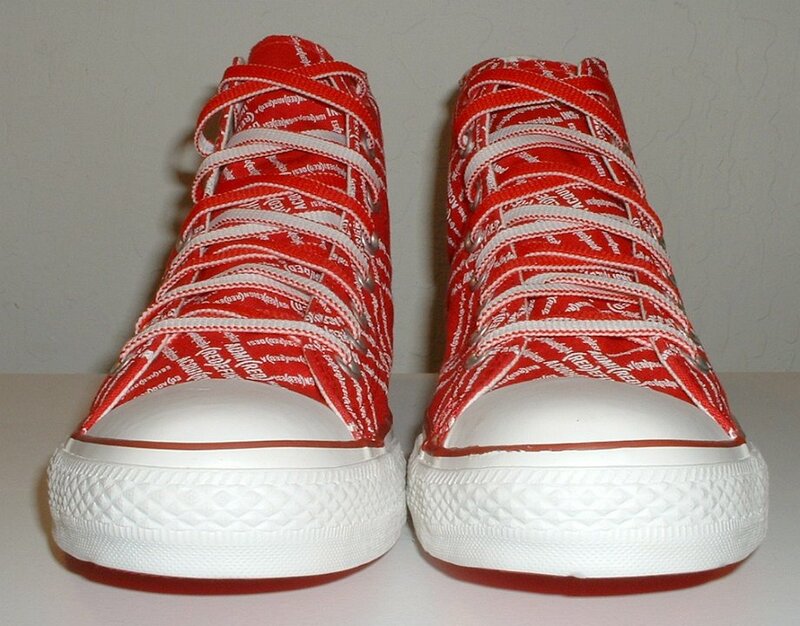 24 Product Red High Top Chucks Angled side view of Product Red high tops with red and white reversible shoelaces. 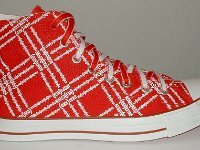 25 Product Red High Top Chucks Front view of Product Red high tops with red and white reversible shoelaces. 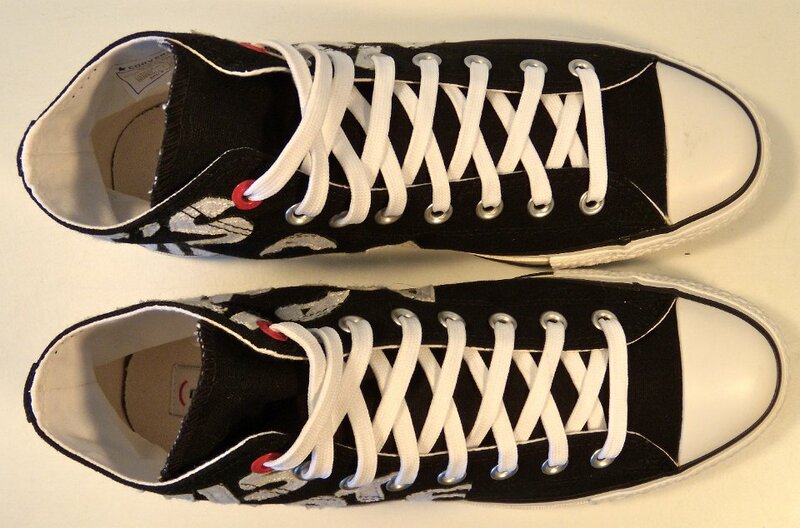 26 Product Red High Top Chucks Top view of Product Red high tops with red and white reversible shoelaces. 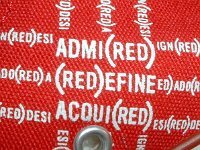 27 Product Red High Top Chucks Close up of the letterinig on Product Red high tops. 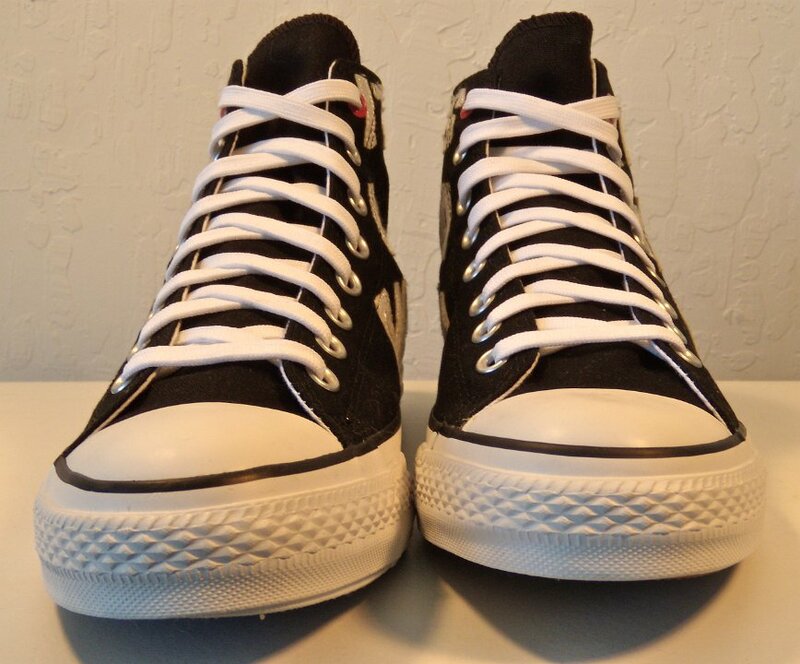 28 Product Red High Top Chucks Inside patch views of Product Red high tops with red and white reversible shoelaces. 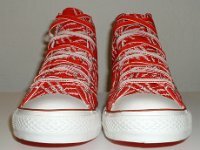 29 Product Red High Top Chucks Angled front view of Product Red high tops with red and white reversible shoelaces. 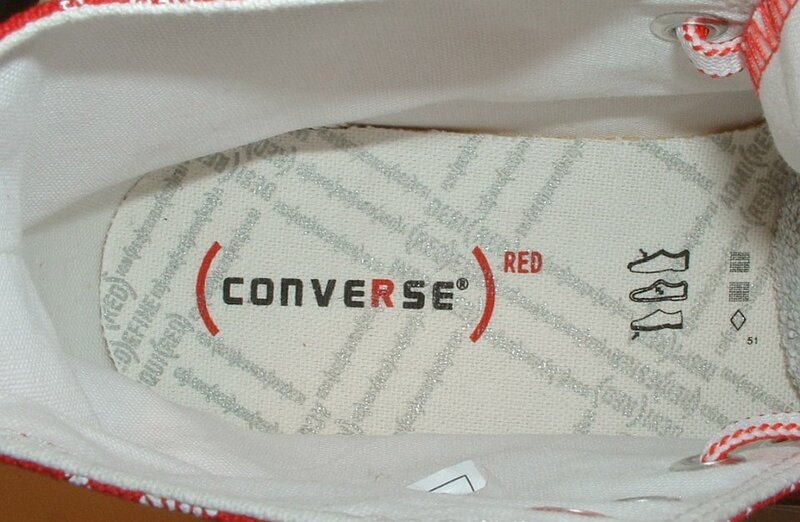 30 Product Red High Top Chucks Close up of the insole in af Product Red high top. 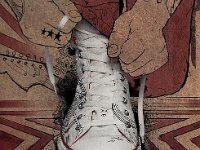 31 Product Red High Top Chucks Inside patch and sole views of Product Red high tops with red and white reversible shoelaces. 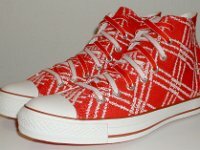 Product Red is a new program started by Converse in 2007. 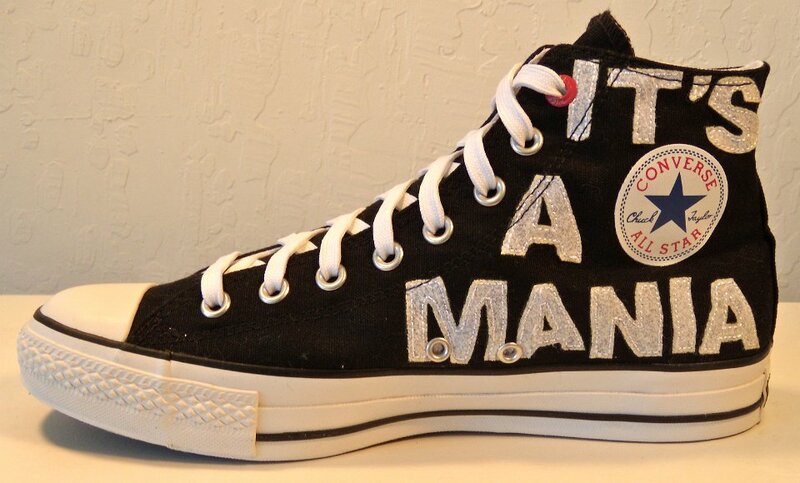 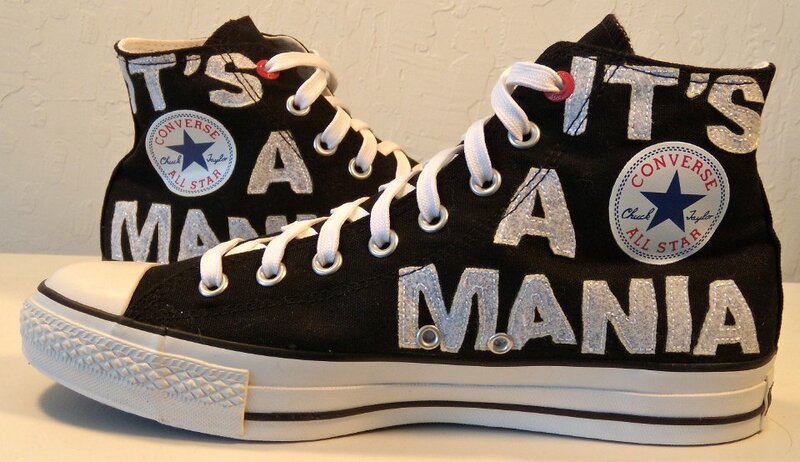 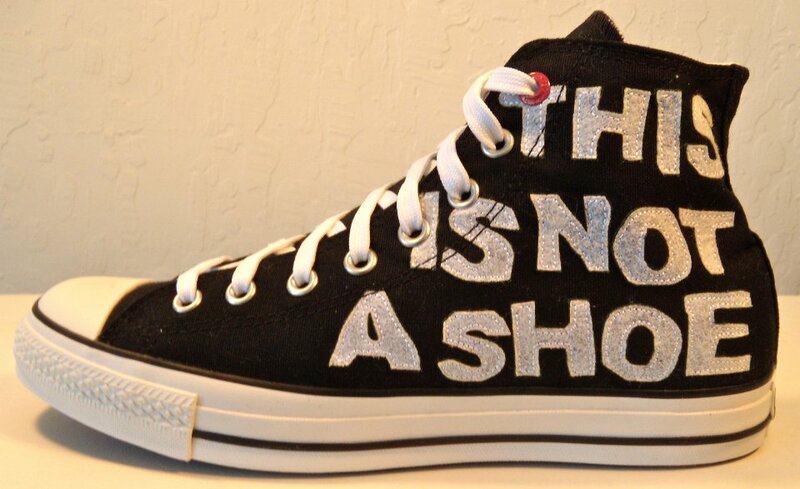 The shoes in the line involve a combination of creative ideas and philanthropy. 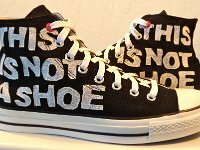 10% of the net wholesale price of each pair sold will be donated to the global fund to fight AIDS tuberculosis, and malaira in Geneva, Switzerland. 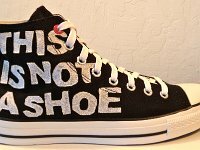 [This is a corporate contribution, so no part of the consumer purchase price is tax deductible under U.S. 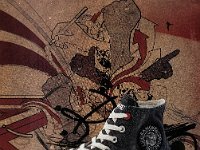 law.] 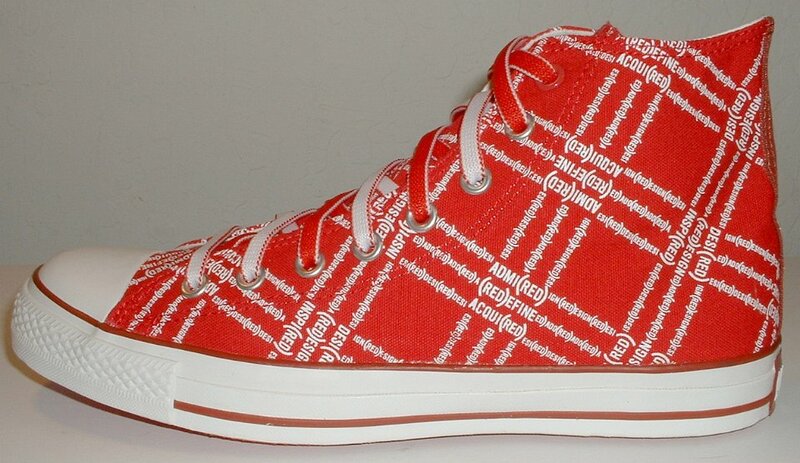 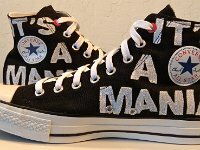 This red and white high top features a diamond shape graphic look on the red canvas uppers made up of words that have the letters RED in them, like inspi(RED), (RED)efined, etc. 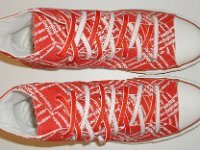 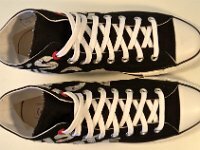 The shoes have bright red outer soles, and a Product Red pattern insole in red, black and gray. 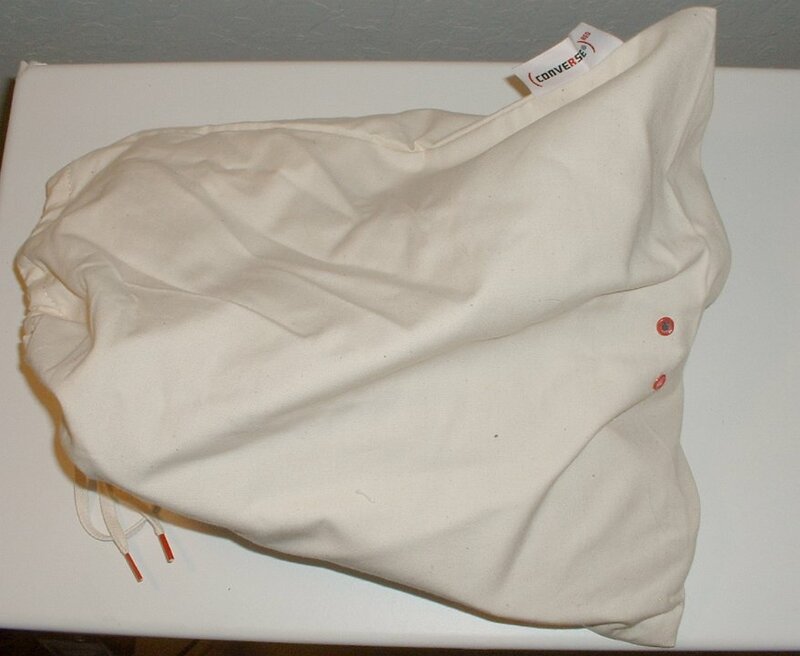 The shoes come in a special canvas bag for storage. 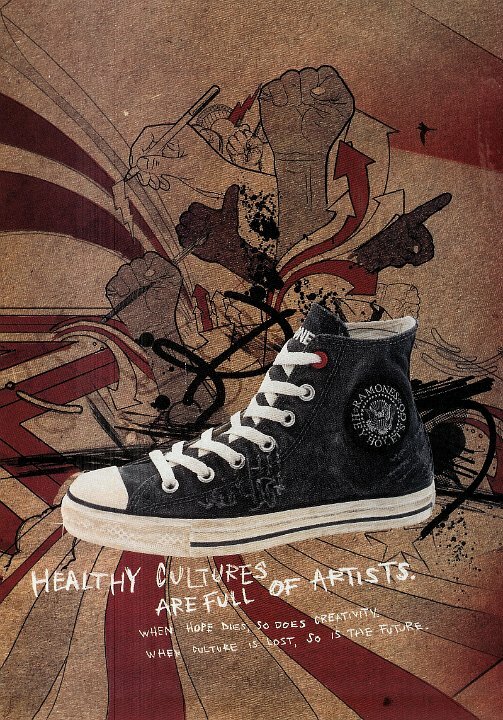 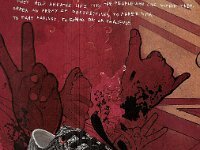 They have a pair of red eyelets at the top of the shoes, on the canvas bag, and on the box. 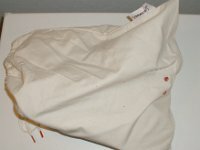 This model also has a maroon ankle support piece, maroon piping, and a white and maroon ankle patch and heel patch. 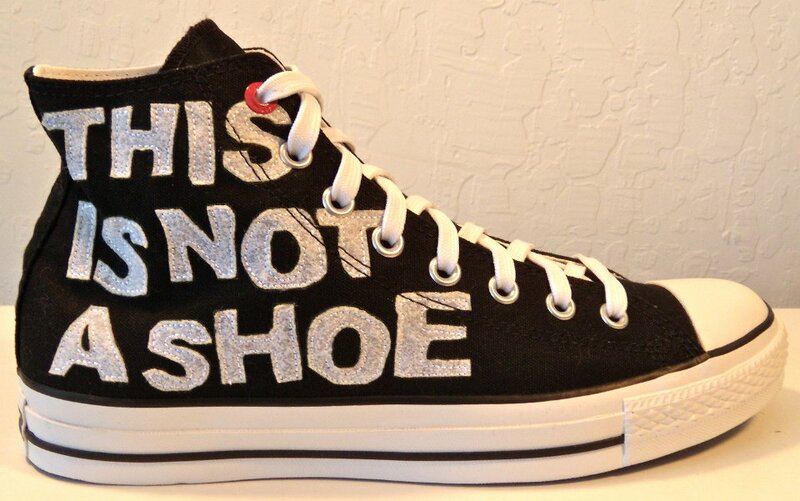 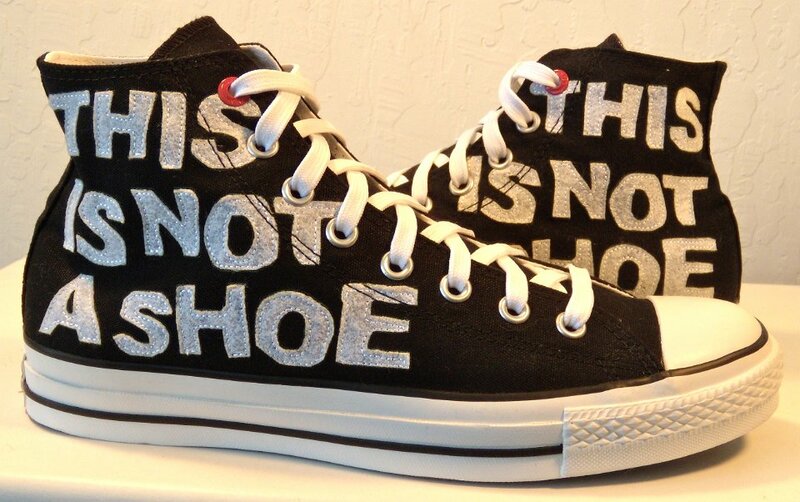 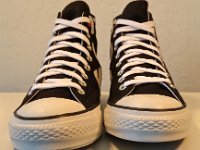 Another example of a Product Red shoe is the Ramones high top.